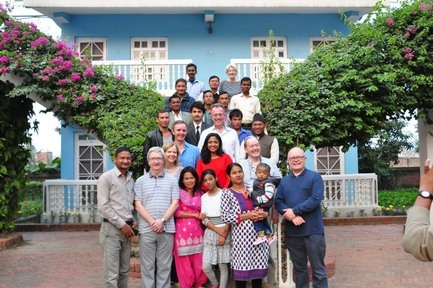 The team for Camp 57 travelled from the UK via Kathmandu. Fuel blockades across the India/Nepal border nearly caused a late cancellation of the whole trip with most Nepali internal flights being cancelled. Fortunately the Buddha Air link with Napalgunj was spared. Some damage from the earthquake in April 2015 was clearly visible in the capital but there was no harm the buildings or roads in the South-western areas. We were a team of 5 surgeons, 2 Theatre Nurses and 1 anaesthetist so we were able to do general anaesthetic as well as many local anaesthetic cases. 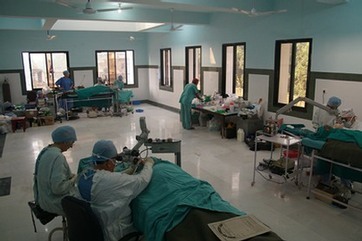 In total 184 major ear operations were undertaken, mostly on local Nepali patients. Operating inside the BECC for the first time. This was the first Ear Camp to be carried out in the new BECC Hospital in Nepalgunj. The hospital is not yet fully finished – there is no floor in the operating theatre – but we were able to set up 3 operating tables in the ward area. The new hospital is a considerable advance on the previous facility with clean marble floors, a dedicated outpatient suite and sound proof audiology booths. The whole camp seemed to be able to work in what seemed like a cleaner and smoother environment performing up to 20 major ear operations each day.